On February 11, 2017 SDBs in Rwanda, for the first time, were able to have worship with their own hymnals. 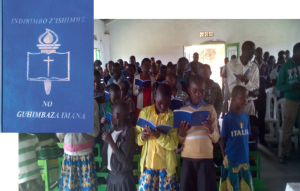 This was realized with the support of SDBs in Burundi , Tanzania & Uganda, as well as the SDB Missionary Society. They were able to compile 346 hymns and printed 500 hymnals, which were distributed to 32 local churches. Thanks to your support we were able to contribute $1,260. Worshipping God in singing is fundamental to SDBs in Rwanda. Before having their own, they used hymnals from other denominations, which at times they thought were confusing and inapproprate. Now their hymns will facilitate both spreading the Gospel and substantiate their identity as SDBs.